Losing weight is one of those things that people believe is much harder than it actually is. With dedication, motivation, and a little bit of hard work, losing weight can be accomplished by anyone. For many people, small life changes can lead to profound impacts that can be life changing. Conventional wisdom says diet and exercise are all you need to start losing weight, but it actually goes much further than that. While everybody loses weight in different ways and some people require surgery from Lap Band Dallas, there are some things that are universally shown to help everybody lose weight. If you’re interested in some of those ways, check out this article to learn ways to learn weight in addition to traditional diet and exercise. Traditional thinking when it comes to dieting is that you need to cut many foods from your life. This is true for a lot of foods, especially if your diet wasn’t too healthy, but instead of subtracting a ton of food from your diet you should actually add some foods. Add healthy foods that you love, preferably fruits and vegetables that don’t contain a lot of calories but will leave you full. Make sure that when adding foods to your diet you still follow appropriate portion control when you eat meals. Fruits and veggies are great to snack on to control hunger cravings, but even eating too much of those foods will not have a positive effect on your weight loss. Also be sure to add a nighttime stroll around your neighborhood to really kick up the weight loss regimen. To many people who want to lose weight, the thought of “working out” seems to be too much to handle. It conjures up images of intimidating gyms, angry people working out, and exhaustion. Fortunately, you can still get great exercise without ever “working out” in the traditional sense of the word. In fact, you can get fantastic exercise just by going for walks. You don’t need to go for multiple mile runs, or go for bike rides halfway across your city. Instead, just walk more. Next time you go to the grocery store, opt to walk rather than drive. If you take the bus to work, get off a few stops early and walk the rest of the way. Going for brisk walks a few times per day will no doubt help when it comes to your weight loss goals. There aren’t really any simpler ways to improve your health than to drink lots of water. Upping your water intake and staying hydrated is key to losing weight and being healthy all around. Drinking a large glass of water before a meal will help you eat less because you’ll feel more full, and portions are key to weight loss. Drinking more water also helps you exercise more, since amply hydration helps keep your body moving. If you aren’t used to drinking a lot of water, slowly up your water intake by a glass every few days until you’ve reached what you feel is a comfortable level. HCG – Amazing Breakthrough or Expensive Weight Loss Torture? Inevitably, whether you’re trying to lose 10 lbs or 100 lbs, the basic equation of weight loss is calories in vs. calories out, and in that equation, the amount of calories you take in needs to be less than the amount of calories you put out on any given day. So why is “dieting” and weight loss so hard? Why are 1/3 of American adults obese and why is obesity on the verge of becoming an epidemic in today’s younger generations (some say it already is)? Of course there’s no single answer but when it comes to tackling hard problems such as weight loss, many of us can’t help but seek an easy way out. We want to lose weight and we want to lose it quickly, which is why so many diets and weight loss fads have become increasingly popular these last few years (or decades). From the Atkins diet to South Beach, LA Weightloss, Alli, Hydroxycut, Ephedra, and plenty of others, there is no shortage of programs and products that promise people quick weight loss. 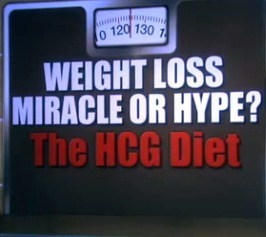 Though the list goes on and on, one weight loss program that seems to be catching the eyes of many is HCG. HCG – Just Another Word Of Mouth Fad? The phenomenon of word-of-mouth “advertising” can definitely be accredited to the HCG diet’s success, allowing it to explode into a nation-wide dieting trend, and while other diets are still around (think Atkins and South Beach), it seems that HCG has taken the world by storm. What many don’t know is that HCG was brought into the dieting world back in the 1950s, but the diet has only recently started to make headlines. As Dr. Serra proclaimed, “It worked. It worked really well. We used these pellets, we followed it and I lost about 30 pounds in 25 days.” This adds up to about a little over a one pound loss each day. These weight loss figures have dieters running to the Internet to find HCG products. Going back to the calories in vs. calories out equation, it’s obvious that HCG works- how couldn’t it? You’re eating almost 1/4 of your recommended daily caloric intake so obviously you’re in the calorie deficit zone. Looking at it from the outside, I’d say that HCG is nothing but a placebo and an easy way for companies, and scammers, to make money. HCG products can cost hundreds of dollars each month and while there’s no monetary value that you can place on losing the amount of weight that may be lost thanks to the diet, what about those who don’t lose a thing, and is HCG a safe long-term way to live? Statistics and common sense say ‘No.’ Kudos to anyone who plans to live on such a low calorie diet to the end of their days, but in the end, what happens is a metabolic downgrade, which then causes the scale to stop moving downwards and in some cases the scale can slowly but surely creep back up, despite eating such low calories on a daily basis. Every diet is going to have its fair share of naysayers, disbelievers, and people who have tried the diet and failed. HCG is no different. While some dieters have been extremely successful using the HCG program, others fall flat and do not experience the amazing weight loss that others enjoy. Seeing, hearing, and reading about others who are successful using a specific dieting plan typically encourages others to join along, but health officials and educators alike warn dieters that HCG may not be all that it is said to be, and the opponents and challengers of the diet have been around for years. For example, in 1995, the British Journal of Clinical Pharmacology published an analysis of research that proved no benefit of HCGusage in promoting weight loss. A study conducted in the same year by the Institute for Research in Extramural Medicine concluded that, “there is no scientific evidence that HCG is effective in the treatment of obesity; it does not bring about weight-loss or fat-redistribution, nor does it reduce hunger or induce a feeling of well-being.” In December 2009, a position paper published by theAmerican Society of Bariatric Physicians concluded that HCG is not a recommended weight loss aid. While the studies are endless and many of the results are inconclusive at best, opponents discourage use of HCG for many reasons. Some say that while the drug isn’t dangerous, dieters purchasing HCG are at risk of falling prey to fraud, as the number of companies selling fake HCG products is on the rise. Though not all HCG products are scams, those that are the real deal come at a hefty price. At a popular weight loss clinic in Florida named New Beginnings, clients interested in the HCG diet plan can opt for a $495 23-day plan or a 40-day regimen for $595. These statistics beg the question of just how much people are willing to pay to drop the pounds. The jury is still out on whether or not HCG is healthy and whether it’s really effective, but there is no question that it worked for Dr. Serra and thousands of other dieters out there. There is also no question about the adverse health conditions that eventually come with obesity. While weight loss, for most people, is as simple as eating less and moving more, weight loss only occurs when internally you decide to make a change. Some people are content being overweight, others are not, and no matter how high obesity statistics are or how many stares one gets for being a bit heavier than others, weight loss takes time, effort, energy, and most importantly an internal unhappiness or some other catalyst that finally forces an individual to make weight loss a reality. So, if you’re overweight and thinking about trying HCG or some other diet, first take a look in the mirror and ask yourself, “Is this going to be the weight loss strategy that works?” If there’s any question about it, keep looking until you find a strategy that you can stick to and finally drop the pounds. Losing weight, gaining muscle, and getting your body into or back into shape can be a harrowing experience. The fat saturated weight might come off, but sometimes it seems like it comes off in all the wrong places. The stomach or abdomen to me appears to be one of those spots where it’s the hardest to get rid of the excess baggage. The Flex Belt seems to be a product which can help elevate most if not all of the problem. No more excuses for getting into shape. You can use The Flex Belt anywhere. It claims that it will do all the work for you. You don’t have to worry about your exercise form or anything. Just put it on and go about your daily routine and let it work for you. Whether you’re new to The Flex Belt, or a seasoned pro, everyone can use it. This is because you can adjust the intensity of the belt from 1 to 150. That’s a really big range. You can use the belt during your current exercise regime if you have one, you’ll simply be enhancing your exercise. The Flex Belt is the result of years of research and has been indorsed by many, including Jerry Rice, retired all-pro wide receiver for the San Francisco 49ers, Oakland Raiders and the Seattle Seahawks It’s concept is relatively simple. The Flex Belt has three medical grade Gel Pads, These pads cover the abdominal and oblique muscles. Electric signals from The Flex Belt reach out to the nerves. These nerves branch out to the entire abdominal muscle system. The signal tells the muscles to relax and contract, just as if the muscles were being used to perform a crunch or a sit-up. How fantastic is that. You get the advantages of doing crunches without actually doing them. The Flex Belt sells for $199.00 which might sound a little high at first, but it’s not unattainable by most, and it seems like its well worth the expense. The first of the year we often find ourselves thinking about New Year’s resolutions. With the top one for so many of us, is the annual tradition which involves taking steps towards a healthier lifestyle. I have noticed many and friends talking about this lately. 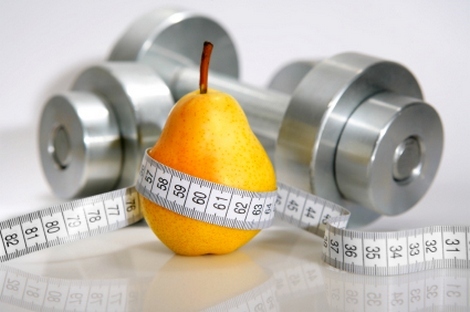 Many of us want to lose all those extra pounds while others just want to get healthier. I have made a lot of changes in my diet in the past few months. I have started watching more closely what I am actually putting in my body and also adding more of the things that I need. For me I needed more Protein and also fiber. Experts tell us we need fiber, which comes from whole grains, vegetables and fruits, to help support your digestive system and maintain immunity. But as busy mom on the go, getting enough daily fiber can prove challenging. In fact, according to the American Dietetic Association, most women only get about half the recommended daily allowance of fiber. As I was looking for more ways to add extra fiber I happen to get an email from Mom Central about a new blog tour for FiberChoice Chewable Fiber Supplements. I admit I had tried these before but I wasn’t making it a daily thing till now! FiberChoice Chewable Fiber Supplement helps remove the guesswork with a simple, convenient, tablet that provides the natural benefits of fiber, while also helping to support the health of your immune system and digestive tract, and overall health. FiberChoice contains prebiotics – a unique fiber that nourishes the friendly, “good” bacteria that aids our digestive system. While the short-term benefits of fiber may go unnoticed, taking FiberChoice every day as part of an ongoing effort helps you to live a more healthy life. 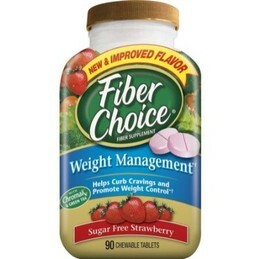 This Time around I decided to try the FiberChoice® Weight Management since I am trying to lose weight! The Weight Management formula is bursting with strawberry flavor. Plus, it helps you curb between-meal cravings and promote weight control. How does it work I am sure your asking right? Since Fiber slows the rate at which your body breaks down food, you feel full longer and chromium picolinate is supposed to help promote fat metabolism. Of course this is when used as part of a healthy diet and exercise program. (SO DON’T think you can just take this and lose weight). I now feel happy that I am able to get the extra fiber I need without worrying about trying to keep up with fiber intake in everything I eat! WATER! We All know we need to drink more! Anybody and everybody will tell you the benefits of water. However, you will find many people that are not big water drinkers! I admit I am not in love with water. I have started drinking more and it’s now something I crave. It took time! Some days are better than others still today. Either way, the point is clear; water does wonders for your body, and your brain. Water is well known to cleanse your body of harmful chemicals through your intestines and also throughout your urine tract. Without proper water intake, our bodies break down very quickly, in a matter of days. Without food, however, some people can live for a week or two. That just shows how important water is to our bodies. 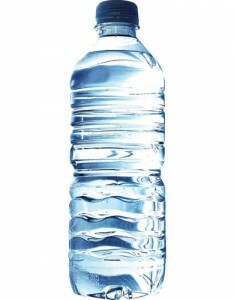 Water is also the number one thing you hear to drink when you’re trying to lose weight! Here are 5 quick tips for taking in more water that have helped me. 1. Always have Cold water available. I like to buy the bottles of water and keep them in the fridge. They are easy to grab and great to carry around during the day. Whenever I am on the computer, watching TV, or just laying down I keep either bottle or big cup beside me the whole time. I take a lot of little sips until it’s gone. A great way of making sure you drink more water is to make sure it is easily accessible and something that you see when you open the fridge. It’s like right there screaming GRAB ME! 2. Have a glass a water as soon as you wake up! Drinking water is the first thing you should do in the morning. It will not only avoid dehydration, but it also serves as a stimulant & lubricant for the digestive juices in your body. Of course, Many have to have that morning cup of tea or coffee before anything , and if this is you just make sure you have water afterwards. 3. Don’t forget the lemon! If your want to add a little taste to plan water lemon does the trick! It’s also good for you! Lemons offer unique natural cleansing and detoxifying properties with no unnecessary calories. Lemon water also acts as blood sugar stabilizer that keeps metabolism up and weight loss moving along. So don’t pass on those lemons! This is a great way to get your extra water in. It has also been shown to help promote weight loss because water makes people feel fuller, inducing us to eat less food. 5. Still not able to get your entire water intake in for the day? Then Feed yourself with fresh fruit and vegetables that bear high water content. Foods that come under these categories – tomatoes, watermelons, cantaloupe, kiwi, grapes – you get the drift. Each of those fresh and flavorsome juicy fruits and veggies are healthy and you need them anyways! These items constitute about 90 to 95% water, so you’ll be able to eat plenty of these without feeling heavy and without worrying about gaining! Now go grab your water your body will Thank you later! Now Share your water tips!